The process of choosing your motorhome can be very exciting but it is also too easy to make a mistake. There is certainly a lot to think about when choosing your motorhome and mistakes can be costly. Here are a few things to consider and some vital hints and tips to make the process as easy as possible. 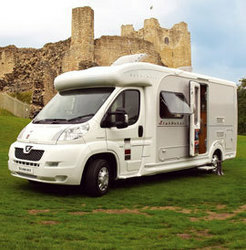 North Newbald, UK (PRWEB) February 5, 2009 -- So you're thinking of buying a motorhome? The process of choosing your motorhome can be very exciting but it is also too easy to make a mistake. There is certainly a lot to think about when choosing your motorhome and mistakes can be costly. Here are a few things to consider and some vital hints and tips to make the process as easy as possible. How many people will be using your motorhome? It is not always better to go for more berth if only two people will predominantly use the motorhome. The use of the home is also important when considering size. As a rule of thumb, the longer a motorhome is in one location then the longer it can be, if you are regularly moving around then a smaller motorhome would be more suitable due to maneuverability and fuel consumption. Remember, the size of motorhomes varies considerably, but the amount of living space can always be increased by awnings and canopies. It is important to set yourself a budget for your motorhome and stick to it. Cost varies according to a number of features, the most obvious being the berth. However, berth is not the only factor which affects price, motorhomes are not just vehicles, they are mobile homes and as such are fitted with kitchens, plumbing and electrical systems. The standard of these fittings varies widely and it is important to consider how often and how long you will use spend in the motorhome, if you plan to regularly spend long periods of time in the home then it is worth paying extra for quality fixtures and fittings. It is always advisable to purchase used motorhomes from a dealership. Although private sellers may offer an unbeatable bargain you should always be weary of an offer which seems too good to be true, the motorhome may be in poor condition or even stolen. Dealerships can offer warranties on used motorhomes and services to ensure they are in top condition as well as expert aftercare. Motorhome security is a big issue and taking proper precautions can reduce insurance premiums. There are many insurance recognized wheel clamps and hitch locks available and the value of immobilising your new pride and joy cannot be understated.